You can buy and IC that does the job for you. The BMS will make sure that the battery voltage does not go below or higher when decharging and charging. A simple O-Amp configurated has a comparator can do the job for low voltage detection/cutoff. Likewise, you can get loose battery protection circuits from places like dealextreme for a remarkably low price (<$1.50). Except these are also usually current limiting, which you wouldn’t want. Most do, but battery packs built for RC don’t include any protection on the battery. I believe this was originally due to weight. RC LiPos don’t have cutoff circuits for good reason. It is bad news if your battery suddenly turns off in-flight. Most small to mid sized RC aircraft have battery cuttoffs built-in to the motor control/regulator circuit. These have ways of warning the pilot on the ground that the battery is almost dead – like cutting power to the motor while leaving power available to the flight control surfaces. Other more advanced TX/RX units are doing telemetry now as well, so that an alarm triggers on the transmitter when the receiver senses low voltage. Come on, am I really the one who needs to suggest using….. an… wait for it… ARDUINO! I thought that too. A trinket would do the job and is only slightly larger than a quarter and under $10. 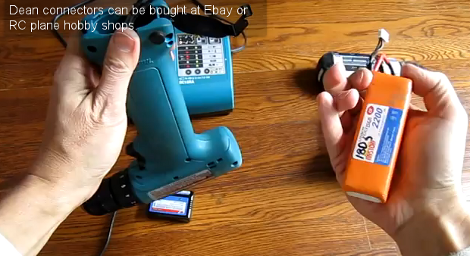 For people who use Li-Ion powered tools and such and also fly RC with Li-Ion batteries, it might be worth investigating whether you can use your RC charger for your power tool batteries, especially if the Makita charger does not do balance charging. Sure, you’d have to rig up some custom adapters and such, but it seems like it’d be very worth the hacking to be able to charge faster and increase the life of the battery. I thought the exact same thing. When the guy says the makita charger doesn’t balance, I ifigured he was gonna say that he was gonna add a balancing lead to it and use a better charger. Are you confusing Li-Ion and Li-Po? They are two different technologies. They are not. The chemistry is 100% identical. They are the same. The only difference is whether the chemicals are contained in a metal container or a plastic one. 18650s are actually plastic prismatic cells (“Li-Po”) rolled up like, well, anything that’s rolled up, then encased in an outer metal can. They are similar concepts, but one uses liquid electrolyte and one uses more solids. The compounds are quite a bit different. Plus, Lipo typically has a higher charge/discharge rate than Li-Ion cells. A low voltage cut off can be as simple as an n-channel FET, a comparator and a couple resistors to set the trip level. That is exactly what my Hitachi drill has inside it. How about a LipoShield low voltage cutoff (LVC) device? You also need over current shut off. Else the batteries can explode in your hand. I found a old 9.6v Makita at Goodwill this summer and did the same hack. A 3cell 11.1v lipo will fit in the handle and the extra volts will give it a nice boost. I used a small low volt buzzer ,also in the handle , to solve the problem of over discharging. It’s a great hack. I use a MAX6457 (http://www.maxim-ic.com/datasheet/index.mvp/id/3492) for the low voltage cutoff. The cutoff voltage is set with a couple of resistors, and the output can be used to control a MOSFET to disconnect the battery as voltage drops below the threshold. Easiest/simplest battery cutout: Human plus simple indicator circuit. Wire a series connected zener+LED+resistor (resistor sized to give say 10mA through the chain so the LED lights and the zener does its thing)with a zener voltage = battery end voltage – 1.6V – resistor voltage drop. Wire it across the motor or device load. When you use the device (drill, whatever), the LED will light brightly when the battery has enough volts. When it goes very dim, it’s close to the end-voltage and it’s time to charge that sucker. Well, that’s what I’d try first. They are SUPER thin, can be embedded in the battery shrink-wrap no problem. Batteryspace also sells cells/packs with these already installed inside the packs. Device from second link has 3A limit, so not suitable for this application as this cordless drill uses much more. Not a big deal. Very simple circuit could do it. You need a n-channel power MOSFET with low rDSon, a resistor to bleed the Vgs down when you want it off, and a zener diode to bias the gate when battery voltage is above the limit. Negative lead (current return) connecting the battery pack with load is cut and MOSFET source is connected toward “-” battery terminal, while the drain is connected toward the load. Thus, MOSFET works as low-side switch for the motor/load. Zener diode cathode, the “sense” terminal of the cicrcuit, is connected to the battery “+” terminal. When battery voltage is higher then Vz + Vgson, the MOSFET D-S will conduct. When battery voltage is lower then that threshold, MOSFET will be shut. You see, my first sketch was with circuitry on the side of the motor, but then I thought “this would get too complicated to present in purely textual description when direction switch is added” (or is direction switch a mechanical device on drill’s gearbox?) so I decided to describe it as if it was on the battery side. My point being: you can divide the circuit differently, keeping battery separate on one side, and undervoltage protection circuitry and switch, motor, etc. on the other side. I have recently worked on a high power LiFePO4 single-cell design. As says above, you need a FET (or two in parallel to reduce Rdson) in series with the battery output. If you can’t find a battery pack safety circuit ready-made for your pack’s cell count and max output current, you can probably design one with some 8-pin SOIC FETs and a Seiko controller like the Seiko S82xx series. You can save yourself some money by eliminating the overcharge protection FETs if you have a good charger and will be charging the pack externally. When I read “Pros and cons of replacing tool batteries with Lithium Polymer” my immediate thought was that someone was not only going to explain this nickel to lithium base swap… but also explain the pros and cons. One warning: do not assume that, just because LiPo cells can deliver much more current than, say, a NiMH pack, they will. There are potential limitations in the control circuitry and the tools’ motor; it might be that the original battery wasn’t actually the bottleneck. In that case, a LiPo powered tool will work perfectly, but if it was gutless before, it’ll remain so afterwards. Thanks for the comments everyone. We did this in approx 15minutes, and, as indicated it is primitive with no engineering thought at all. As we mention in the YouTube comments, there is no discharge rating on this cheap LiPo cell, however, in our experience they can put out extraordinary amounts of power. * At the moment, current limiting is not high on my list of priorities. However, low voltage protection is something I’ve done a little bit of investigation into and I appreciate the links and commentary here. My goal is to be able to whip up a very simple PCB and have some protection. As for the comment about adding balancing to the Makita pack and using a separate charger… we’ve thought about it. We don’t have 5cell chargers handy so it is something we’ll look at. * We have shorted mostly dead cells and they results are impressive, these are scary powerful/dangerous. You can find some lipo alarm on internet for 5 bucks. It’s intended for use with heli and plane RC models, and sounds loud enough to get stressed when the voltage drop under 3.2V on a cell. These drills can take a peak amperage of around 15Amps or more so the protection circuits need to be rated for at least that. I did a similar swap and tried a 4 cell configuration with 7A protection circuit from ebay and it did not work. 7A was just barely enough for the smallest screws. Also the lithium battery needs to be rated for that kind of current. E.g. scavenged 18650 cells from laptop batteries are great for many projects but they don’t work for this kind of load. Finally I ended up using a 3 cell RC battery which can give up to 45A continuous current. The ability to deliver amperage really matters. there are drawbacks that can be overcome by packing the battery in a way to decrease vibration. Lithium polymer tends to swell when drained at high amperages or when damaged by shock. the price of the batteries has dropped so swaping out the old nickel cadmium cells over to lithium polymer is economical, not to mention the advantages that come with using lithium batteries.Can’t wait till lithium sulfur comes out.